Large charitable organisations, such as the Bill and Melinda Gates Foundation, are currently rivalling governments as the providers of social welfare, yet the businesses which generate their charitable largesse frequently contribute to economic instability and compound global inequalities. There are 85,000 of these private foundations in the US, about 5,000 now established each year, and the distinction between profit making and benign activity is becoming increasingly blurred. Linsey McGoey is a senior lecturer in sociology at the University of Essex, and a former adviser to the WHO. 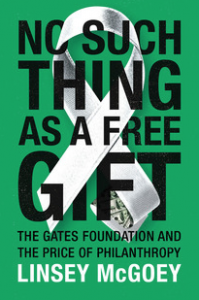 She has published widely in the media, and her new book No Such Thing as a Free Gift: the Gates Foundation and the Price of Philanthropy (Verso, 2015) examines the issue, asking whether this market-based philanthropy is actually doing good or simply perpetuating the inequalities it purports to remedy.